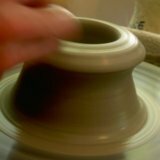 What does it take to learn how to make pottery on the wheel? 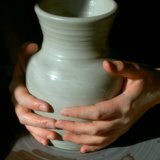 Here are the three pillars of pottery making, plus the best free online lessons and classes on clay, throwing and buying equipment. Also, below are five essential supplies to get you started. Pottery Defined - Pottery is the process of forming pots (bowls, cups, vases and more) out of wet clay, then firing it in an oven to make it hard and usable. The first two, Supplies and Instruction , can be found right on this website. Keep reading for more information. The third thing, Patience, you have to bring to the equation. The hardest part about learning how to make pottery is the initial learning hump. 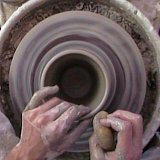 You will probably need about 10-20 attempts before you are proficient at centering clay and making a bowl. From that point the sky is the limit as you expand your skill into more advanced projects like coffee mugs, vases, teapots and more. The hardest part, however, is getting over that initial hump. If you can remember to be patient, have fun with learning, and keep trying you'll enjoy pottery and be able to take it as far as you want. People make pottery for a variety of reasons; as a fun hobby, to express their creativity, to make functional pots for use around the house. Many people even become full-time, professional pottery artists. This is just a space to put yourself, your tools and your wheel. It could be a garage, a basement a spare room, or the corner of your kitchen. Don't have much space? Check out the link above for some creative ideas on how to turn a cramped space into a great studio. Wheels come in many variations. The main types are kick wheels and electric wheels. Some wheels are large and weigh hundreds of pounds, while others are small enough to be used on a table and stored under the bed when not in use. Clay is the magical sticky, yet solid substance that you form the pots out of. In it's wet form it can be molded and re-molded. It will hold it's shape after forming. It is soft when wet and gets stiffer as it dries. A few basic hand tools are all you need: a sponge, a knife, a cutting wire, a cutting needle, and a hard scraping rib will do. A kiln is basically just a heat source for cooking your clay pot. It bakes the moisture out of the clay and melts the clay just enough to fuse the clay particles together, making it very hard and permanent. Kilns use different types of fuel to make the heat including gas, wood, and electricity. Most towns have a store or school where you can fire your pottery if you don't have your own kiln. 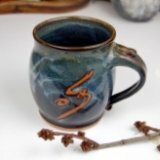 Click here for 5 Ways to Learn Pottery, several of which most people don't think of.